Religion has become a problem. Or rather, religion has been made a problem. Reduced to being a maker of meaning and marker of identity, it has become a maker and marker of difference, a difference that, in the North Atlantic world, against a normative Christianity, is often the difference of Islam. And within a creeping intolerance, this is a difference that is not allowed to be. 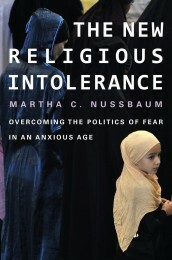 It is this intolerance that concerns Martha Nussbaum in The New Religious Intolerance, a work that attempts to name both the cause of this intolerance and the means for its overcoming. In an elegantly simple formulation, Nussbaum argues that the cause is fear (ch. 2), proposing that, in the name of a democratic political culture, this fear is overcome through a clarification of the political principles of equality (ch. 3) and a coherent and consistent ethical practice of equality (ch. 4), actualized by a curious imagination (ch. 5). In a time of growing religious intolerance, Nussbaum offers a powerful articulation and defense of an American tradition of democracy, a democratic practice that is grounded in an equality that can function as a bulwark against intolerance. The New Religious Intolerance is a decidedly contemporary work, quite consciously arising within the long shadow of 9/11, a shadow that is, it seems, growing darker. In The Liberty of Conscience, written only four years earlier, Nussbaum tells a story “in which religious fairness faces threats from both the “right” and the “left,” from arrogant secularism as well as from aggressively insular forms of Christianity,” (10) and presents, in the case of Islam, a post-9/11 America in which “we have something to be proud of” (347). In The New Religious Intolerance this rather benign sounding threat appears on the verge of turning violent, and America is less likely to produce a sense of pride. Rather, the US is now being overcome by “religious prejudice and fear,” “ugly fears and suspicions that disfigure all Western societies” (2). Today, Nussbaum worries, “fear is accelerating” (19). On the one hand, the more optimistic tone might be attributed to Liberty of Conscience’s abstract focus on constitutional law and political philosophy, as opposed to the greater cultural orientation of The New Religious Intolerance. But the new pessimism is also a reflection of a changing mood in which American identity is seen by many to be under a greater internal threat than was the case in the immediate aftermath of 9/11. Here, Nussbaum makes a helpful comparison with Europe. Beginning with a rather dangerous generalization that is only later nuanced, she argues that European nations have understood themselves to be constituted through historically specific identities, based on blood, soil, ethnolinguistic peoplehood, or religion (13). This has led many European nations to develop quite strict practices of assimilation that make it difficult for new immigrants to become proper citizens, while at the same time discouraging internal heterogeneity. Today, fueled by a renewed religious fear appearing as Islamophobia, these practices include burqa bans, bans on minarets, and religiously directed violence. Downplaying the appearances of Islamophobia in the US, Nussbaum argues that direct prohibitions against religious practice have not yet appeared in the US at least in part because its civic membership is grounded not through a historical identity, but “in terms of shared goals and ideals,” a political and ethical commitment to democracy (18). Ideally, this identity makes possible a toleration of heterogeneity, a toleration of internal heterogeneity that has often mitigated against an internalized violence. Further, Nussbaum argues, this identity, and America’s commitment to democratic equality, allows for a move beyond tolerance – which remains bound to social hierarchy, as “a privileged group says that we will indulge you but retains the power not to do so, should it change its mind” (70)—to an expansive liberty that pushes to friendship (245) and even to love (57). But not only is the US not moving toward a greater love of religious difference, a deeper friendship with the religiously other, or even a tolerance of religious diversity, it seems to be moving closer to the religious prohibitions and violences that have already appeared in Europe. And this, Nussbaum argues, is because of fear. Drawing on the findings of neuroscience, philosophical rhetoric, and cognitive psychology, Nussbaum argues that fear is a rather primitive emotion, one that is probably quite helpful from an evolutionary perspective, as it is “a form of heightened attentiveness—but of a self-focused, indeed solipsistic kind. It reduces to a kind of vivid awareness of one’s own body, and perhaps, at best, of a narrow circle of people and things closely connected to the body” (28-29). Fear is, in other words, narcissistic, and in its extreme, a threat not only to society but also to love (57). Although not explored in the present text, this conceptualization of fear in relation to the body is particularly helpful in trying to understand contemporary fundamentalisms and their extreme interest in the regulation of (female) bodies. What is more important in the present case is Nussbaum’s methodological turn to scientific research to understand fear both as an emotion and as an emotional agent. Although this is useful for determining the nature of fear and how it functions, it leaves scarce resources for analyzing the ideological projection of fear. For fear is, as Nussbaum recognizes, “easily displaced onto something that may have little to do with the underlying problem [that is threatening the self]” (23), a displacement that is influenced by culture, politics, and rhetoric (29-30), a displacement that often obscures the issues at stake (47). Although the turn to science allows Nussbaum to present fear as a generalized cause of intolerance, we are left wondering why fear directs itself to religion, and, more specifically, to Islam as the religious difference that becomes a problem. As I have already noted, Nussbaum proposes that this intolerance can be overcome by a clarification of political principles of equality and a coherent and consistent ethical practice of equality actualized with the aid of a curious imagination. The political principles Nussbaum clarifies are those concerning human dignity and equality, especially as these have been interpreted in American political and legal theory. This clarification proceeds by proposing four premises: first, that “all human beings are equal bearers of human dignity” (61); second, that governments “may not violate that equal dignity, and in general they ought to show respect for our equality and dignity” (65); third, that conscience—“the faculty with which people search for life’s ultimate meaning” (65)—is closely related to and a part of what constitutes human dignity; and fourth, that the conscience can “be impeded by bad worldly conditions” (65). Together, Nussbaum argues, these premises lead to the principle that “liberty should be both ample and equal,” which is, following John Rawls, amplified as the principle that a just and democratic equality requires “the maximum liberty that is compatible with a like liberty for all” (68). Here Nussbaum offers a convincing case for understanding equality as requiring an expansive practice and defense of religious liberty. Yet in grounding human equality and dignity in conscience, and understanding religion primarily as a practice of meaning-making, religious practice and materiality appear as unessential and accidental. Nussbaum clearly recognizes that religious practices and material cultures are to be protected within an expansive defense of religious liberty, but they are to be so protected only as adjuncts to and extensions of the meaning-making practices of religion. Together with her earlier focus on the general emotive character of fear, this deemphasizing of religious practice and material culture functions to depoliticize religion, overlooking the many ways in which religions not only make meaning, but, in quite literal ways, make the world. Political principles are never enough; also necessary, Nussbaum argues, is the development of a coherent and consistent ethical practice. Drawing on Greek, Christian, and Kantian thought, Nussbaum proposes that the ethical practice of the political principles of liberty and equality is fundamentally a practice of non-hypocritical equality (102). The ethical life is, for Nussbaum, at least a life that recognizes the equality of all, and, through this recognition, is a life without personal exemption. Nussbaum uses this ethic of non-hypocritical equality as a theoretical ground from which to criticize, with devastating effect, the arguments made in support of the recently proposed burqa bans in Europe (104-132). Although this ethical critique is quite effective, it is the humor of its delivery that seems most proper. In a wonderful comic tone, Nussbaum responds to the “arguments” for the burqa bans by showing, through a comparative presentation of her comically overdone Chicago style—bundled from head to toe to survive blistering cold winters, and just as bundled from head to toe to hide from the sun while watching the White Sox—the irrationality of these arguments. To the extent that this humor can easily turn to mockery, this is a dangerous method, but sometimes the only proper response to an irrational intolerance arising from an irrational fear is humor. Nussbaum is able to avoid mockery because she has herself developed, and so is modeling, a well-developed imagination, “a displacement of mind, a curious, questioning, and receptive demeanor that says, in effect, ‘Here is another human being. I wonder what he (or she) is seeing and feeling right now’ . . . a willingness to move out of the self and to enter another world” (140). This curious and empathetic imagination is necessary, Nussbaum argues, because it is only through this imagination that equality and liberty become not merely principles but felt realities of life; it is only when one can imaginatively feel an other as equal that it becomes possible to practice political and ethical equality. Exploring Roger Williams encounter with the Narragansett Indians, Gotthold Ephraim Lessing’s play Nathan the Wise, George Eliot’s novel Daniel Deronda, and the children’s literature of Marguerite de Angeli, Nussbaum presents this curious and empathetic imagination at work. As grounding the possibility for the practice of a politics of equality and liberty, and so as the condition for resisting and overcoming fear, this curious and empathetic imagination moves beyond understanding, and, again, beyond tolerance, to a minimal type of friendship: a “curiosity, listening, responsiveness, [that is] a willingness to acknowledge a full life and world over there, outside ourselves” (187). With this theoretical elaboration of the cause of religious intolerance and the means for its overcoming in place, Nussbaum proposes to explore what this religious equality and liberty might actually look like by analyzing the Park 51 controversy. She begins with a wonderful debunking of many of the “facts” that have constituted the debate around Park 51, before moving to narrow the debate down to two questions: “First, do the developers have a constitutionally protected right to build an Islamic center, including a mosque, on this property? Second, is it wise (sensitive, helpful, well advised) for them to go ahead with this plan in the light of the controversy that has erupted?” (200-201). Supposing that the first question is easily answered in the affirmative, Nussbaum spends the bulk of this chapter exploring the second. Unfortunately, she does so by focusing on issues that are more properly related to PR than to philosophical, political or ethical analysis. This has the effect of proposing a set of values that are quite different than we would demand in a democracy of equality and liberty. For if the question of Park 51 is whether there was a proper PR wisdom, then the criterion of evaluation returns to tolerable acceptance, a criterion that might itself still accept intolerance as the condition of its work. This is an unfortunately unsatisfying end to an otherwise helpful and important work. Nussbaum, Martha. The Clash Within: Democracy, Religious Violence, and India’s Future. Cambridge, MA: Harvard University Press, 2008. Print. Nussbaum, Martha. Liberty of Conscience: In Defense of America’s Tradition of Religious Equality. New York: Basic Books, 2008. Print. Taves, Ann. Religious Experience Reconsidered: A Building-Block Approach to the Study of Religion and Other Special Things. Princeton, NJ: Princeton University Press, 2009. Print. Here she is following one of the most recent trends in religious studies, a methodological turn to science that attempts to de-mystify religious understanding and explanation. See, for example, Ann Taves’ Religious Experience Reconsidered. Alan Van Wyk is an independent scholar living in Bangalore, Karnataka, India. He holds a PhD in religion from the Claremont Graduate University. His research is in religious and cultural theory, focusing on politics and ecology.